One of my main purposes in writing this book is to encourage priesthood leaders to invite the sisters to more fully participate in developing solutions to the difficult problems confronting members of the Church. Too often family councils are held only when the parents feel there are problems — and when parents think they have all the answers. . . . Family rules and procedures are more likely to be accepted and followed if all family members have been given the opportunity to participate in the discussions and agree to the rules. When ward leaders fully utilize the inspired council system and focus the efforts of the quorums and auxiliaries on improving the spiritual and temporal well-being of ward members, miracles happen in the lives of families and individuals. I believe that the day has come when we cannot hope to build the Church and to bring the hearts and souls of our members to Christ without using every resource the Lord has given us to help us take advantage of our opportunities and address the obstacles standing in our way. For example, leaders throughout the Church are greatly concerned about the spiritual maturity of many members. We worry about the inactivity of so many new members of the Church. I believe that the answer to these concerns lies in the proper understanding and use of our councils, particularly the ward council. In view of the accelerating growth of the Church and the ever-faster unraveling of society's moral and spiritual fabric throughout the world, it is increasingly imperative to empower leaders of stakes, wards, and homes to do whatever it takes, in harmony with gospel principles, to bring people to Christ. Every person and situation is unique in some way. While principles are universally applicable, practices are not. As every parent knows who has tried to rear the second child exactly like the first, what works in one situation may fail in another. The central activity of leadership is teaching — first by example, second by precept. After that, leaders become a source of help as their empowered stewards assume the responsibility and exercise the initiative to do whatever is necessary, consistent with the principles taught, to fulfill the shared vision. 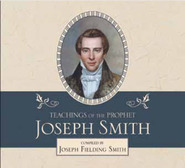 The most advanced, universal, and practical leadership philosophy ever put forth was given in this simple statement by the Prophet Joseph Smith: “I teach the people correct principles and they govern themselves” (quoted by John Taylor, in “Journal of Discourses,” 10:57-58). Area presidencies are to teach stake presidencies the overall vision, direction, purpose, and correct principles of the Church, and then they are to let stake presidencies govern or manage their stakes. A similar pattern applies to bishops and their wards and to parents and their families. “Wherefore, now let every man learn his duty, and to act in the office in which he is appointed, in all diligence” (D&C 107:99). This empowerment process requires leaders to exercise great patience while modeling Christlike behavior; building caring, trusting relationships; setting up clear role and goal expectations; identifying sources of help; and requiring accountability. Generally, Church leaders teach principles, not practices. Inspired stake, ward, and family council members learn to convert principles into appropriate practices through the whisperings of the Holy Ghost. For example, after teaching the principle of daily family prayer, a father may ask, “How and when should our family hold family prayer?” The family may determine to hold family prayer just before the children go to school. This may become a family practice for many years. Later, the family may find it more practical to hold family prayer in conjunction with the evening meal or at bedtime. Practices may change, but fundamental principles and purposes do not change. As leaders work with their councils, careful attention should be given to this admonition from the Lord: “For behold, it is not meet that I should command in all things; for he that is compelled in all things, the same is a slothful and not a wise servant; wherefore he receiveth no reward. Verily I say, men should be anxiously engaged in a good cause, and do many things of their own free will, and bring to pass much righteousness; for the power is in them, wherein they are agents unto themselves” (D&C 58:26-28). When so empowered, council members will become amazingly creative and willing to take the initiative in doing whatever is necessary to accomplish worthy purposes within the guidelines of well-understood principles. 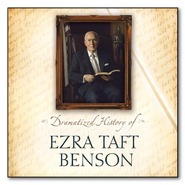 Great narration by Elder Ballard himself. The book is wonderful! It’ll help with any church or family council. A book for ANY council! Our stake president bought this book for every bishop in our stake. It is just that good. 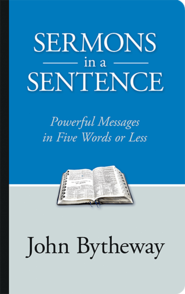 My husband and I both have used this book in our callings and in our homes. This book teaches you simply and correctly. We both would recommend it for everyone who holds a calling in which counseling will be done. Elder Ballard helps us understand how a church meeting can truly be effective. If you're tired of boring and non-productive meetings, then get everyone to read this book. 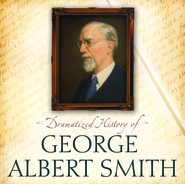 Of any book at Deseret, my husband chose this for his birthday gift, and he hasn't been disappointed. Elder Ballard's teachings can truly help in counseling more effectively in our callings and families. Unlock the power of your councils. 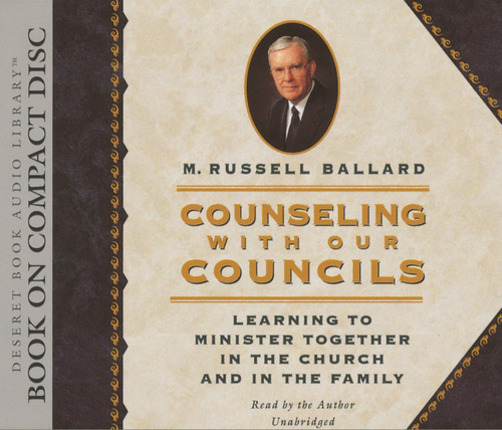 Elder Ballard writes clearly with real life examples of how counsels can and do work. His teachings find direct application in our ward council, and our family council. These teachings apply to councils full of life-long members and new members of the church.